Brookfield's Earth Day Trash Bash! First annual New Milford town-wide "Trash Bash" clean up event is planned for Saturday, April 27 and open to all community members. Join forces with fellow community members to clean up our beautiful town of unwanted litter. 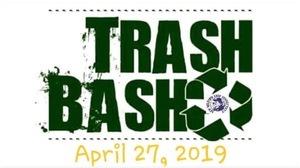 The Trash Bash will begin at 10:00 am on April 27 in celebration of Earth Day. We will meet as a group at the Young's Field pavilion. Trash bags will be provided. Food will be provided to our volunteers after the event compliments of La Noce's Gourmet Market.